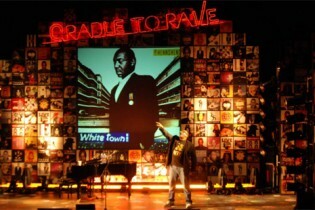 Modular and lightweight, the set was easy to transport and install in all venues on this nationwide tour. 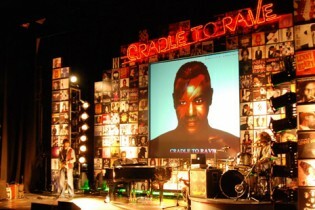 Ply clad timber flats provided the frame for a 10m by 5m grid formation of spoof record covers, topped with a custom made 5.5m long ‘Cradle to Rave’ ropelight ‘neon’ sign. The printed floor cloth was created in two overlapping sections able to accommodate different stage sizes and we also provided a tracking and raked 4m circular drum riser.